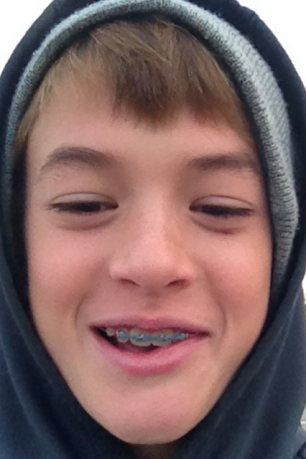 Daniel Ayers: Age 11. Skills - sister and family dog torture. Weaknesses - peas and total lack of volume control. Daniel is having 4 friends over for his birthday today and the high is expected to be in the low 40's. Not a good combination for fun. This means LOTS of boys inside the house. Prayers appreciated. I am quite good at girl parties. I have a ton of awesome games, activities, crafts, and amazing projects that I can pull off to prevent drama and create fun. With boys I am just absolutely clueless - and frankly just a bit scared. He has many talents - and he is pretty skilled at ruining a perfectly good photo for his sisters. One thing is for sure, he has a crazy wit and sense of humor that makes him a blast to have around. He's a good kid, full of compassion, and he loves the Lord. I can't wait to see the mighty man of God he turns out to be someday. 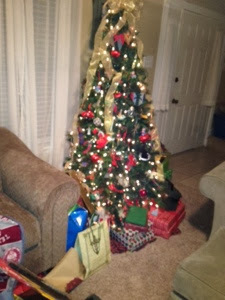 We had a fun Christmas this year! It came in a bit stressful for Mom - starting off the whole weekend sick, but Dad stepped up and finished the shopping, kept it all together and pulled it off. We were able to celebrate with both sides of the family and attend the Christmas Eve service at church, yet we still had plenty of time to relax and enjoy. 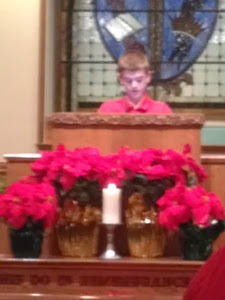 Daniel read the Christmas story for the service, and he did a great job. 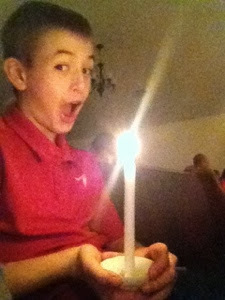 Candle light service fun. Yep, I'll be going back to the church with some wax paper and an iron to get up the ton of wax this boy dribbled EVERYWHERE. Ugh. We try our best not to focus too much on gifts, but it's always a challenge. I am continually shocked by the extravagance of their friend's Christmas gifts. What a typical picture of the three! 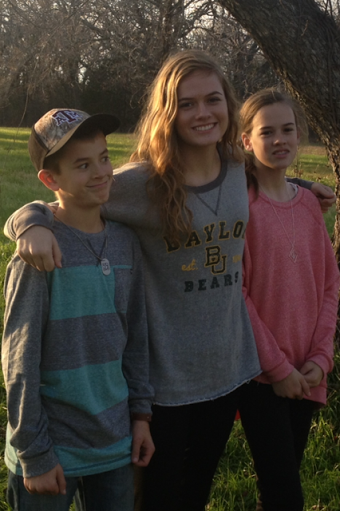 'tis the season for every kid in the Ayers family to have a birthday. We have some pretty significant ones this year too. Ally turned 16 earlier this month! 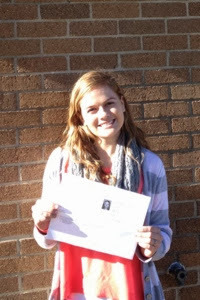 She got her license the very next day and has done very well driving the Jeep (which is also a standard). 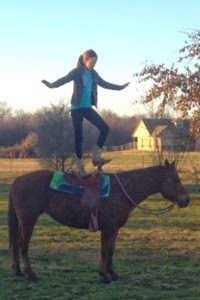 Although we were a bit concerned at first, we have decided this is an excellent skill for her to master. And actually, driving a standard requires constant focus, which is also a very beneficial thing. You have to pay attention, and you can't get lazy in your driving. Gracie has her birthday coming up very quickly on the 5th of January - turning another monumental 13 years old. 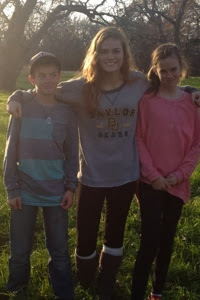 Now, we have TWO teenagers. 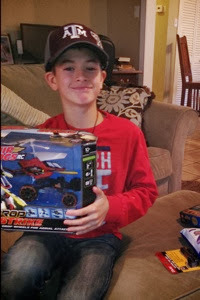 And of course, last but not least, December 30th, the youngest member of the family, Daniel turns 11. Is November really over? No way! This year has been crazy. We have got to slow down. 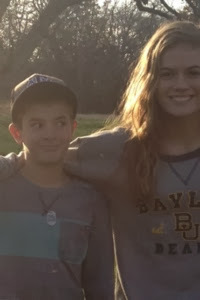 December means we will have a 16 year old and a 11 year old. 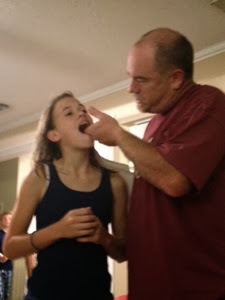 And shortly after that in early January, Gracie turns 13! 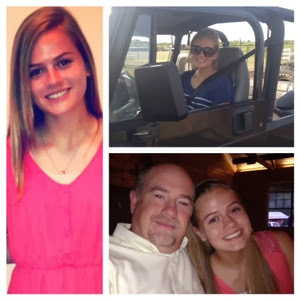 We are very close to having a house full of OUR OWN teenagers instead of everyone else's. Byron has lost almost 50 pounds. He LOVES to cook Thanksgiving food and snack and eat on it for days after. So, we knew we didn't need to do that this year. 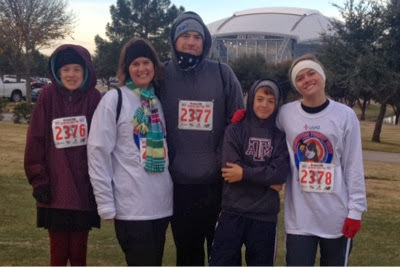 So, we decided to run a Turkey Trot 5K in Arlington. We've wanted to do this for several years, but just haven't. But, boy, was it cold. It was 34 degrees when we started running. We are all wearing several layers in this picture. 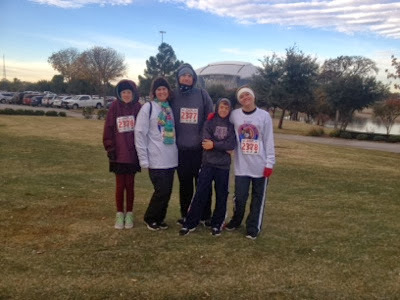 We warmed up as we ran, though and we all had a really fun time. 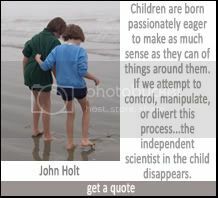 The kids couldn't wait to do it again, and we certainly learned a lot. Byron and I went on a romantic overnight date on our anniversary. We celebrated 22 years of awesomeness. I love him more today than ever. 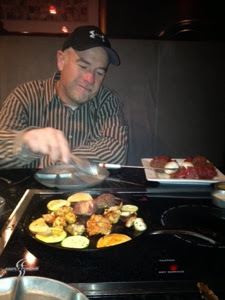 We were not, however terribly impressed with cooking our own raw meat at Simply Fondue. It seemed like a cool idea, but we didn't like it. 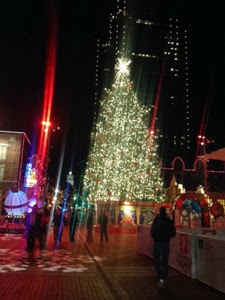 We walked around Fort Worth and had a great time. 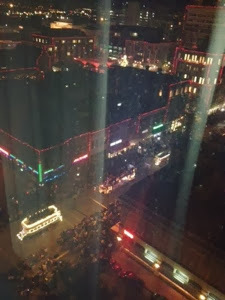 Our anniversary weekend always coincides with the Parade of Lights in downtown Fort Worth. Such a fun city to walk around and hang out. 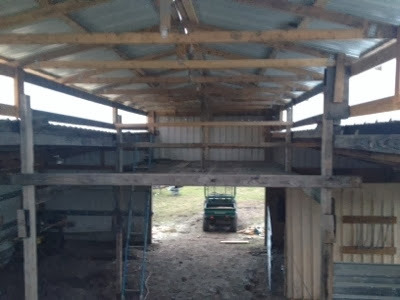 Our barn is turning out great! 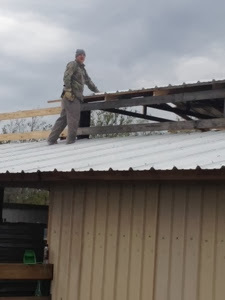 Byron is almost done with the tricky stuff - climbing around on the roof to get all the metal on! 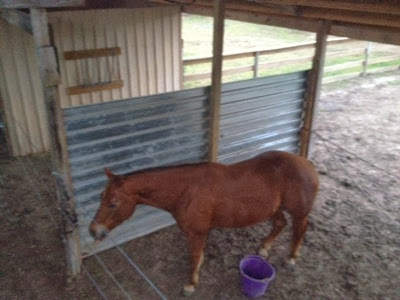 We'll eventually have a great space for storing stuff and room for a shop for Byron. Byron took some time off from work to really get it finished up and it FLOODED for the entire time. This is a great picture that I took before he was done with the top. It's all enclosed and dried in now, and ready for colder temperatures. Our dog LOVES to come with me to pick kids up from school. I let her get in the back of the truck and she runs errands and hangs out with me a lot in the afternoons. Until this happened. 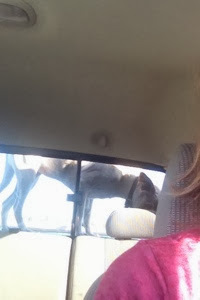 She started climbing on the top of the toolbox and peering out over the cab when I was going around 75mph! She was up there shaking, crying, and couldn't get down. I pulled over and got her down, but I think her short little dog years passed before her eyes there for a minute. Hope you all are having a warm and happy December! We are in the middle of a Texas ice storm today, so everyone is curled up and cozy inside. Blessings! 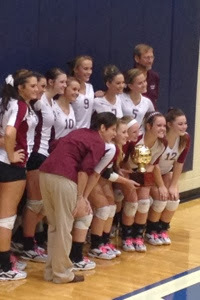 Ally's volleyball team is headed to the playoffs. She is #5 there. Bad picture, I know. We are all kind of ready for basketball season. A season we are blessed NOT to take an athletic interest in. We can regroup, rest, and restore. 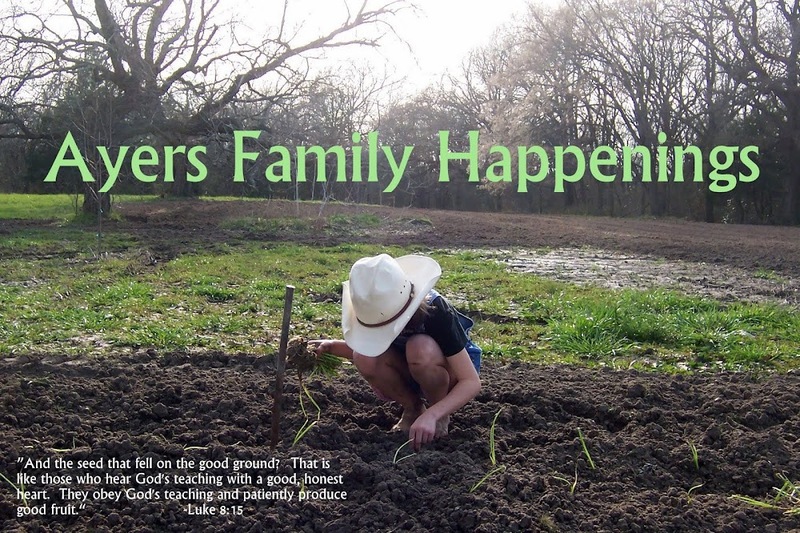 Family time and the holidy season will be much anticipated without rushing off to practices and games constantly. 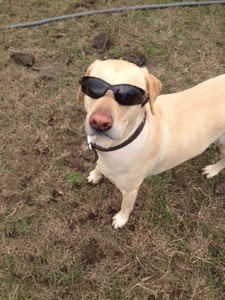 Yes, our dog just might be cooler than your dog. We have had a constant period of huge rains. Just over 6 inches last week and our whole property is MUDDY and this dog has been my #1 enemy of late. Picture muddy dog tracks leading in paths all over my floors. Ugh. Why an inside dog? 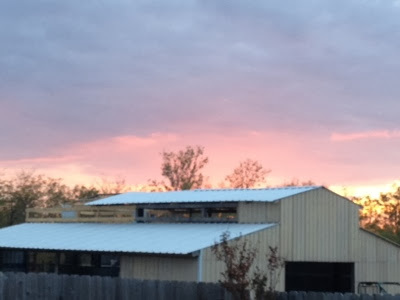 This is what most of our property looks like right now. 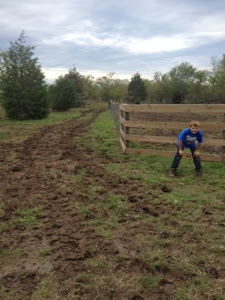 The horses are a couple hands taller with so much mud on their hooves and everything is tracked up and nasty. Byron was just beginning to disk up the back pasture area and smooth it out, so it is particularly bad back there, but we are hoping for a good crop of grass before it gets cold and we have to start buying hay. 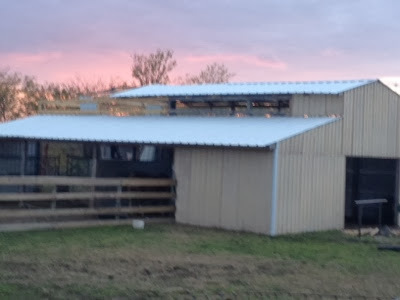 Byron has almost finished the barn roof. He intended to make more progress, but all the rain put a serious kink in his plans. 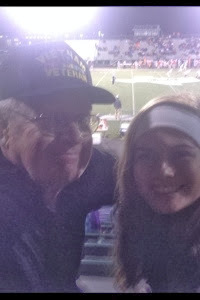 Ally and grandad watching football. 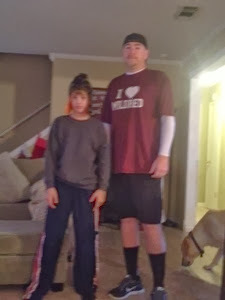 Our highschool team is headed to the play-offs -probably that will be going on until December so it will be awhile before that is done, but Daniel's pee wee season ends this week. He gets to play in Cowboy's stadium this weekend - his last game. 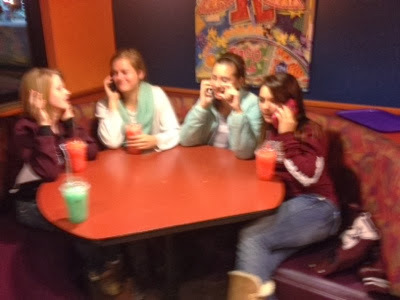 This is what it is like to go anywhere with a group of teenagers. Ridiculous. We've started declaring many media-free days and nights lately - an absolute necesity for any family. Eye-contact has become a lost artform. 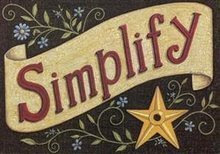 But, you know we are hip and we embrace the modern. We can do duck lips selfies with the rest of them. 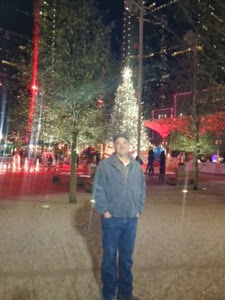 I'll try my best to get a few more blog posts in before the year end. Got that big 16th birthday coming up in only a month - and lots of holiday plans to put together. Fun times! We've had some minor milestones around here lately. Gracie lost her last baby tooth tonight. Now she can make room for the full-on braces on top and bottom. Crazy to think she'll be 13 and Ally will be 16 in just a few months. 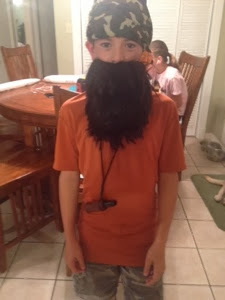 Daniel the Duck Commander. How can 1 TV series inspire so many dress up events? 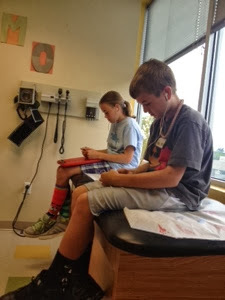 I remember when they were little and a doctor visit meant me pulling out all the stops to keep them entertained. Now, free doctor's office wifi and I don't even hear a peep out of them. Gracie had crazy sock day this day btw. 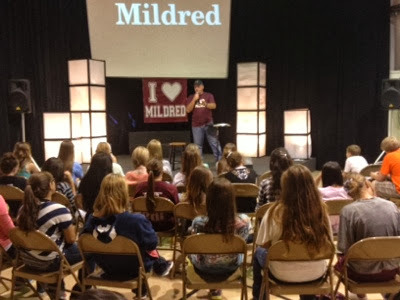 The new school year means we return to our crazy Wednesday youth nights. Our new stage lights are fashioned out of white air filters and black duct tape. Pretty cool looking though, huh? You can tell by the picture, this is the girl's side - we always divide them up - less distraction. 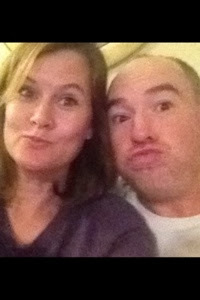 And... we learned to Snapchat - and mastered the fine art of the duck lips too. We are just too hip. In case you are old - Snapchat is a not really so new method of communication - texting in pictures with an app on your phone. Not so revolutionary, really. The catch is that the pictures are sent and when received they disappear within a few seconds. It seems harmless enough, but it also gives teenagers a faulty sense of security - they often send pictures that are more risque - feeling that since it can only be viewed a few seconds, it's okay. The problem (aside from the obvious purity issues) is - you can quickly screen shot the picture (that means take a quick picture with your phone - for you old people). And...I'm pretty sure there's gonna be a scandal someday and we're gonna learn that all the disappearing Snapchat photos are really going to some creepy app creator guy somewhere. In that case, Mr. Creepy Snapchat guy, I apologize for all the odd pictures we've sent into your cyberspace inbox. We had fun sending Ally some crazy Snapchats. She especially appreciated those of Byron's armpit. On a totally unfunny note - it really is important to get all into the methods of communication and online involvement your kids are into - for parents and grandparents alike! It just changes the way students look at their online activity when Grandma might pop into the conversation at any moment. 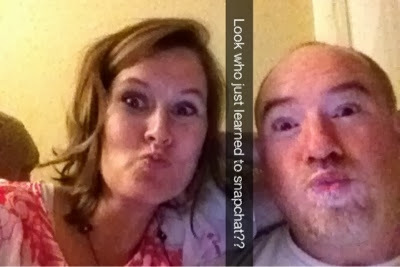 You'd be surprised how many kids are snapchatting - especially younger kids with ipods. And besides, who doesn't love to see a good picture with some duck lips or a bathroom mirror pic with the toilet in the background?